Blessed Claudio was born into a poor peasant and devout Catholic family at Santa Lucia di Piave, Italy. From a very young age, he helped in the family fields and perhaps more so, after his father’s death in 1909. When World War I broke out, Blessed Claudio was drafted into the Italian Army. After he was discharged from the army, he pursued studies in art and sculpture. He graduated with honours from the Academy of Fine Arts in Venice and then joined the Franciscans. He chose to be a lay brother rather than a Priest and follow their rule of prayer and penance. By day, much of his time was spent sculpting and painting religious scenes but particularly of Jesus and the Saints. By night, he was often found in deep meditation to the Blessed Sacrament. Following his early death at the age of 47, many miracles were attributed to his intercession. 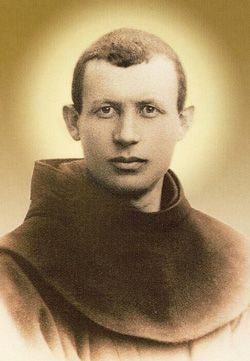 He was beatified in 1994 by Pope John Paul II. Pray for us that we will find the peace and love of Jesus in our everyday work.